Today is February 1st, the “oneth of the month.” This is the day that we do our monthly maintenance chores like feeding the dog her monthly Heartguard, adding bleach to the septic system, etc. This year, it’s also the day after the rare “super blue blood moon”. It was “super” because the moon was at perigee, “blue” because it was the second full moon of the month, and a “blood” moon because it also marks the occurrence of a lunar eclipse. It was also the 32nd anniversary of the day MBH and I got married. Yep, I’m a lucky man. You may have noticed that I didn’t post anything last Wednesday. That’s because MBH and I took a quick road trip to visit some folks in Texas. 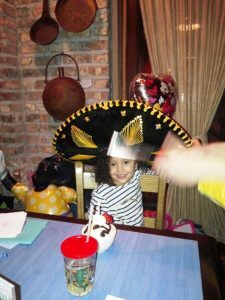 Ever notice how birthdays and celebrations seem to come in waves? Well, the end of January and beginning of February is just such a wave for our family. There is our son’s birthday, our granddaughter’s birthday, my mother’s birthday, my brother-in-law’s birthday, our anniversary, and a very close friend’s birthday… all within a matter of a week. We also had some personal business we had to take care of. We all managed to cram a lot of life into those few days. 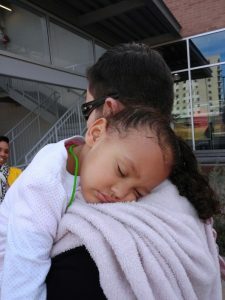 It was a whirlwind trip that left us pretty much exhausted by the time we made it back. And as you can see, we weren’t the only ones exhausted. Not a lot to report this week. Payne and Suffering – P&S is moving along. I had a nice revelation over the weekend that revealed a bit of a plot flaw, as well as its solution. That has meant some rewrites, which in turn means not as much improvement on the actual word count. It also means that the story is pulling together better though, so no complaints here. The book is currently sitting at a bit over 32k words. Once I finish the rewrites, I expect to be back on track to finish the first draft by the end of March. Now, I do seem to recall that I promised myself that I wasn’t going to spend too much time on this blog post each week, since my time should be spent on writing my actual titles, so I’m going to make this one a very short post this week. So take care of yourselves, and stay safe. Belated Merry Christmas, or Happy Hanukkah, or Winter Solstice, or whatever holiday you may or may not celebrate. I hope you had a good one. Now, I’m not sure if it’s because of the holidays, or because of all the traveling I’ve been doing lately… or maybe it’s just me getting older… or my brain not firing on all cylinders. Maybe it’s a combination of all of the above. For whatever reason though, I truly thought today was Wednesday. So yes, here’s another Website Wednesday post going out on a Thursday. Late on Thursday, at that. Now, I’ve not posted a lot over the last two months anyway. I mean, three “weekly” posts in two months is hardly a reliable schedule. But like I mentioned in the first few sentences, there’s been a lot going on. I mentioned back in WW93 and WW95 that the contract work I was doing had me traveling. What I didn’t mention was just how much I was traveling. For five weeks, my schedule was something like this… Monday morning at 3:30 AM, MBH and I would get up, get ready for the day, and get me to the airport between 4:30 and 5 so I could catch a 6 AM flight from Tulsa to Atlanta, Georgia. With the time difference, that put me arriving in Atlanta at roughly 9 AM. From there, the company I was working for had arranged for me to rent a car, so I would travel the two trams from the gates to the rental facility, get the car, then drive from Atlanta to Columbus Georgia… about an hour and a half drive. 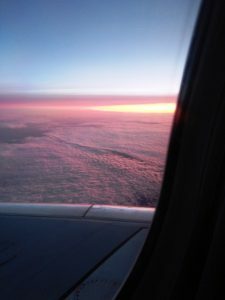 Now, this sometimes meant some absolutely beautiful sunrises from the plane. Of course, there were some pretty nasty mornings, too. As you can imagine, during the winter months, the weather was somewhat less than reliable. As a matter of fact, my last day on the job was December 8th, the day an unseasonably bad winter storm rolled into Atlanta. You remember me mentioning Atlanta, right? The airport I flew in and out of for the job? Yeah, that’s the one. That storm on December 8th was bad enough that Delta alone canceled more than 600 flights. And of course, mine was one of them. My initial flight from Atlanta to Tulsa was supposed to leave at about 4:30 PM. I got there at about 2:30, returned my rental, rode the tram back to ticketing, and found that my flight had already been changed. My 4:30 ticket was rescheduled for a 10 PM flight. About 5:30, they announce that my 10PM flight was canceled. As a matter of fact, that was when Delta decided to cancel just about every flight out of Atlanta. So thousands of other people were also finding out that their flights were canceled, too. That meant there was a mad scramble of people who were A) trying to book alternate flights out for the next day, and B) trying to find hotel rooms for the night near the airport. Yours truly got extremely lucky in both regards. First, when the gate attendant announced that all those flights were cancelled, customers were instructed to line up at some desk so that booking agents could get them booked on flights for the next day. I saw that line folks. Within the first couple of minutes, it was hundreds of people long. So I went to the gate attendant who had made the announcement. And while he explained that he wasn’t supposed to do it, he did put me on standby for a flight leaving at 8:30 the next morning. He warned me that there wasn’t much chance of my actually getting on it, since it was already full, but that it would almost guarantee that I made a later 2 PM flight. So I got my room, got a decent night’s sleep, and made it back to ATL an hour and a half before the 8 AM flight that I was on stand-by for… me and forty-one other people. Yep, there were forty-two of us on the standby list for that flight. As several of us sat around talking about the situation, we found out that the order in which they chose who got the stand-by seats was a matter of who got on the list first the night before. That meant that I, by virtue of the gate attendant helping me out, was number six on the list. 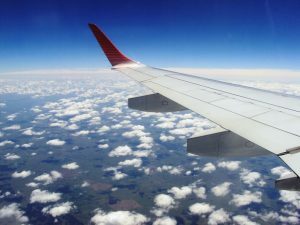 As the flight time approached and the flight crew began gathering information, we found out that there were five cancellations. So I was number six, on a flight with five open seats, and I resigned myself to waiting for the 2 PM flight to Tulsa. Ten minutes before they were going to close the cabin door, they began calling for a David Williams. Five minutes later, they announced the final call for Mr. Williams, letting him know that if he didn’t get to the gate immediately, his reservation was going to be canceled. One minute after that, they called my name. David Williams had just freed up seat number six. Woot! Of course, we still weren’t out of the woods. 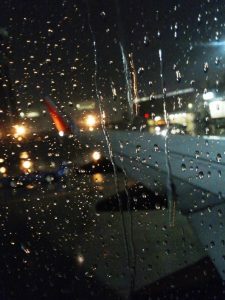 Because the weather was so unusual for ATL, the airport was still running behind. 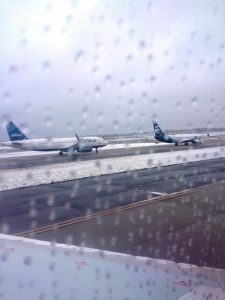 Our plane pushed back from the gate, taxied a short ways onto the tarmac, and promptly announced that we were in a line of fifteen to twenty planes waiting for clearance. It was an hour later that we moved once more – this time to another group of jets – all of us waiting to be de-iced. 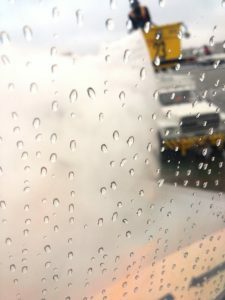 Ever had the opportunity to see the wings on your jet getting de-iced? It looks a lot like this picture. As a matter of fact, it looks exactly like this picture… some guy in the freezing weather, on a cherry-picker, with a high pressure hose, spraying what looks like a mixture of water and sand at the ice and snow that’s caked on the wings. And then we went back into line for the runway. Twenty minutes later, we took off, and I don’t think I have ever been so glad to be in the air. It was a day late, but I made it home. It was the end of the job… the end of having to travel every week, living out of a suitcase, and missing MBH. You would think I was done with flying around for a while, wouldn’t you? Remember me mentioning a while back that Baby Bird had been accepted into a Master’s program in Santa Fe, New Mexico? Guess who went to help her move? You got it. I flew from Tulsa to San Antonio, where she had made arrangements to get a moving truck. Of course, my flight was three hours late, so she had to move the pickup time back. But luckily, she had gotten some of her friends to help us load the truck. The bad news was that she was on the third floor. That was forty-two steps up to her apartment, forty-two steps back down. Eighty-four steps for each trip to the truck… or to the dumpster. By the end of that day, my legs felt like rubber. To top it off, her internet provider, who was supposed to send a tech out to pick up the router “sometime between 8 AM and 9 PM” still hadn’t shown up by the time she was supposed to go to a goodbye dinner that her employer was throwing for her. So I stayed in her apartment, waiting for the tech that I was pretty sure wasn’t ever going to show up. Baby Bird left to go to her dinner at 7:30. At a few minutes before 8, she texted me asking if they had come for the equipment. When I told her no, she said they had sent her a receipt, indicating that they had completed the service request. Just to be safe, I stayed until 9, so we could honestly say that someone had been with the equipment for the entire service window. Next morning, I drove the moving truck, and she drove her car from San Antonio, to Santa Fe. We got there late, but the apartments she was moving into had arranged for the head of their maintenance crew to meet us. He let us in and helped us move in her bed and a few other essentials before we called it a night and she drove me to my hotel. We spent the next few days getting her moved in and mostly unpacked. Then on Christmas Eve, Baby Bird drove me to Albuquerque airport, where I once again got to catch a delayed flight. I have to say this though… they’re smart about it in Albuquerque. 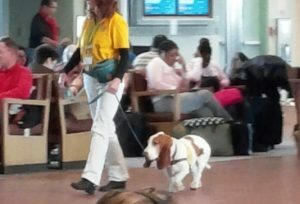 They have dogs that they walk through the place with “PLEASE PET ME” printed on their vests (the dogs, not the walkers.) But I got home in time to spend Christmas with MBH. And as much as I love Baby Bird, and spending time with her, I also didn’t want to spend Christmas away from my wife. It occurred to me recently, that out of the six weeks of flying, I think there was only one flight that actually left on time. Five weeks to and from Atlanta is ten flights. Add to that the two flights involved in getting from Tulsa to San Antonio, and the two from Albuquerque to Tulsa, and I only recall a single flight that actually left when it was supposed to. I don’t remember flying being such a problem in the past. Oh well. It’s done for now. And more importantly, I got carried away with this post, so an already late post, has just gotten even later. So stay safe, and I’ll talk to you later. Next year, even. WW96 – Pangaea: Exiles Release and Happy Thanksgiving! 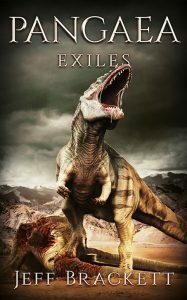 Yes, Pangaea: Exiles was released last week. It was a bit of a surprise, since I had turned in the final edits back in August. I heard nothing back from them after that for the next few months. I’m not complaining, mind you. I know that working with a publisher is much different from publishing indie, and I am far from the only author they have in the stable, so I was okay sitting back and working on other projects in the meantime. Then, out of the blue I got an email on the 11th. It was pretty much, “Hey, you okay if we publish this thing next week?” Obviously that wasn’t the exact wording, but that was the gist of it. Well, hell yeah, I was okay with it. The only problem was that I was on the road when I got the email. You remember me mentioning that Baby Bird has been accepted into a masters program? Well, It involves her having to move from San Antonio, TX to Santa Fe, NM. Yours truly was in Santa Fe with her, helping her find a place to live when she moves. Needless to say, that made it a bit difficult for me to work on any of the normal release items. So there was no newsletter, no cover release, no nothing. 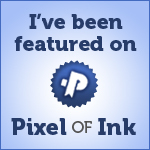 Just a post on Facebook… “Hey everyone! My book is out!” And since I didn’t get home until a week later, by the time I was in a position to make an announcement, it was pretty much old news. Still, I suppose I should go ahead and send out an announcement newsletter, since not everyone follows me on Facebook or on this blog. On another note, I hope you all had a fantastic Thanksgiving (at least, those of you who celebrate the US Thanksgiving). Ours was low-key, just MBH, myself, and my sister-in-law. SIL, who knows of our love of buffalo meat, brought us a buffalo tenderloin to cook for our thanksgiving meal (we seldom do the whole turkey and dressing thing). We cut it into individual serving sizes, put them in a marinade, and into a vacuum container to make sure the marinade got into every ounce. On the traditional day of gluttony, we pulled the steaks out, put a nice searing rub on them, and tossed them into a scalding hot cast-iron skillet for a few minutes on each side. That ended up being the absolute best bit of red meat I’ve ever had in my life! 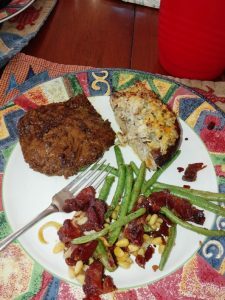 Top it off with MBH’s crab stuffed portobellos, and fresh green beans roasted with bacon and pine nuts, and WOW, that was a fantastic meal. Definitely something to be thankful for. And that’s all I’ll bother you with this time around. 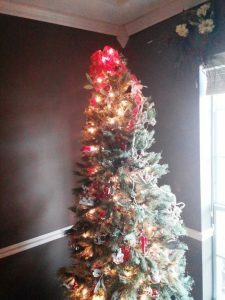 I have another topic I was going to talk about, but it’s a more serious discussion… back to the nuts and bolts of the writing world, and not necessarily something that fits with the tone of today’s post. Besides, it gives me something to write about next time. So that’s all for now. Stay safe, and I’ll talk to you all later. Remember back in WW93 when I mentioned that the IT contract job I was working on might end up getting extended? Well, it did. They’ve been flying me back and forth between home in Claremore, Oklahoma, and another of their locations in Columbus, Georgia. The routine is a little rougher now, starting on Monday mornings at 3:30 AM so I can make a 6 AM flight that gets me to Atlanta, where I rent a car and drive an hour and a half to Columbus. Needless to say, I’m pretty wiped by the end of the day on Monday. Then on Friday, I work until about 1 PM, drive the hour and a half back to Atlanta, fly back to Oklahoma, where MBH picks me up and takes me home so I can spend the weekend with her. And if Friday’s flight home is delayed by three hours (like last week), then the day goes on even longer. Then Monday morning at 3:30 AM, it starts it all over again. I don’t mind the work, but those Mondays! The up side is that the job is paying (at least for a little while) some of the bills that were beginning to pile up. The down side is that it impacts the writing. Of course, I already discussed this, too, back in WW93. So nothing new there. But while the writing has been greatly slowed, it hasn’t completely stopped. Payne and Suffering – The new Amber Payne novel is a bit over 7500 words. Not huge, but it’s moving. I picked MBH’s brain a couple of weeks ago regarding some of the threads that were stumping me. Many writers talk about their “muses”. I don’t need a muse. Ideas and inspiration aren’t my problem. I have trouble with the more mundane minutia (wow, talk about your alliteration). I tend to let the details of a story keep me from progressing… the old “can’t see the forest for the trees” thing. I get an idea or a scene, and I lock onto it, trying to work it into the story, and when it doesn’t work, I can’t seem to see my way around it. When that happens… when I find myself banging my head against the same wall, over and over again, I can usually count of MBH to guide me through a doorway that I simply didn’t see. This time was no exception, and she once more helped me find a new path through a winding and overly convoluted story line. Yes, once more, I was making things more complex than they needed to be. Thank you, wife. Pangaea Exiles – Nothing new to report here. Final edits were turned in to the publisher more than two months ago. As far as I know, cover was approved, edits were done, but no word on an actual publication date. Year 12 – The audio version of Y12 is also moving very slowly. In this case, I know what the hold-up is. When you find someone who is willing to work on a royalty share basis, slow production times are the trade-off. After all, the voice actor also has bills to pay, and he or she has to give priority to those jobs that come in that offer an up-front payment. Crazy Larry – No change on this one. I hit a brick wall, and haven’t opened the manuscript back up in almost two months. I think I know what needs to be done with it, but the changes entail a LOT of extra work. And it had already gone from a project I was enjoying, to something that turned into a frustrating chore. I began to think of it less as a story, and more of a justification. So for now, it still sits. So that’s it for writing news. How about a random pic? The Random Pic of the Week for this week is another of the many sunset pictures I find myself taking. 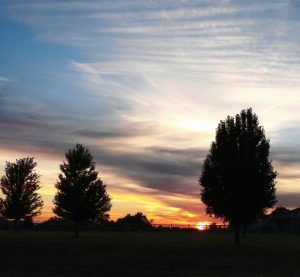 I don’t know why, but we just seem to get some amazing sunrises and sunsets here in Claremore. The colors… the texture of the clouds… it all makes for some incredible sights. As much as I loved living in Texas, I find that I love my new life here in Oklahoma even more. And as beautiful as the sunrises and sunsets are, the star-filled sky on a clear, crisp night is even more breathtaking. We never had skies like this around Houston. Okay, that’s enough gushing. Time to get back to it. You guys take care, and stay safe. I’ll talk to you again soon. This week’s post has nothing to do with writing. No reports of progress or lessons learned in the business. This week is about Hurricane Harvey. It’s about the friends and family that MBH and I left behind in Houston when we moved to Oklahoma three years ago. 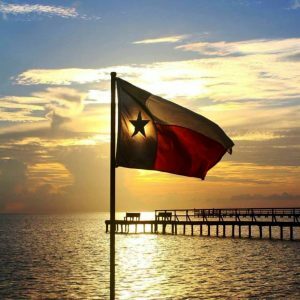 It’s about recognition of the way they, and Texas in general came together in the face of one of the worst natural disasters in recent history. BTW, if any of you ever wondered why I’m such a strong proponent of prepping, look at the picture here. That was taken the day before Harvey made its first landfall. 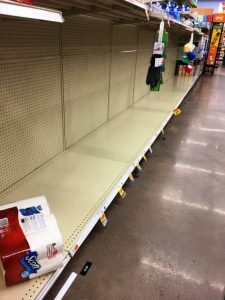 This is typical of store shelves just before a disaster. I’ve been through a few such events, and seen this repeated in most instances. But moving on… For the most part, our friends and family have come through without any serious damage. 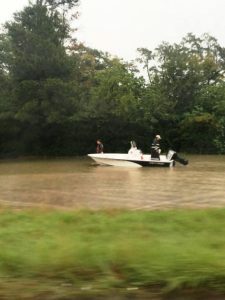 My son & his family evacuated when things got close, but they got out before any water got in, while it was still safe to do so. And as it turns out, they made it through without the water actually getting in (though like so many others in the Houston area, it came REALLY close to coming in. My brother from another mother, James Husum, lives in The Woodlands, just north of Houston, and was house sitting when Harvey hit. 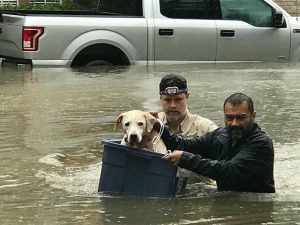 He was trapped away from his home, with several dogs, while the water rose and trapped them in. But other than a leak in the roof, there was no water damage in either his home, or the one where he was staying. Another friend posted on Facebook that he and his family had been forced to leave their home and had taken shelter in a local high school. And my cousin Brenda Jackson, who is an awesome amateur photographer, has taken all sorts of pictures from the area where, until three years ago, MBH and I called home. The picture to the right shows a strip center where we used to stop pretty often. The pic is taken from a freeway overpass through a rain-streaked window. Just to the left of the frame of this pic, there is (or at least, there used to be) a Smoothie King where we would occasionally stop for a light dinner or lunch. Now to be perfectly honest, this picture isn’t that much of a surprise. The area has flooded several times in the last few years, a victim of all the construction that’s popped up around them. This picture (to the left) hits a little closer to home, though. It’s taken from hwy 249, and you can see the water is up onto the freeway. If I’m not mistaken, this is near the exit for an HEB grocery store we used to shop at quite often. It’s where we used to buy our buffalo flank steak for grilling. By the way, you can always click any of these photos to see an enlarged version. 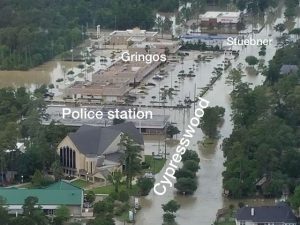 The picture below to the right shows a strip center near my sister and brother-in-law’s place. We’ve eaten at that Gringo’s restaurant on a few occasions. 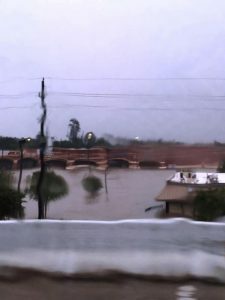 I honestly don’t recall it flooding before, but since it was a little farther from our home, I’m not as familiar with the area. I found this picture online. Another picture from Brenda here (left). She called this one, Boat on the Feeder. Yes, that’s the feeder road to a freeway. It’s a shame that it took a flood of such magnitude to wipe the previous flood of political crap from our news feeds. But since the goal of our media “services” is to sensationalize everything, it takes something huge to refocus them. The message I see repeatedly coming out of the news now is that people are helping one another. Joe Everyman is grabbing his fishing boat, kayak, canoe, or fishing waders… if he’s high and dry, then he’s moving to where he’s needed. I’ve read numerous accounts of people launching their boats and helping out wherever they can, and I’m proud to know so many of them. To the right here, my cousin, once removed (Brenda’s son Jason) is helping a friend get a family and their dog out of danger. 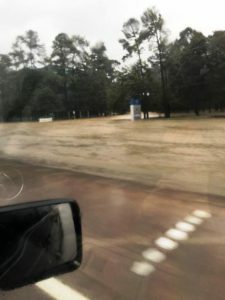 One of my former martial arts instructors has been posting videos on Facebook as he has worked for the last few days, helping to get people and animals to dry land. I know others who have worked (and are still working) at getting supplies from surrounding areas into the shelters where they’re needed. As a matter of fact, the church where my parents went for years was just recently remodeled. It’s been closed for months during the process. 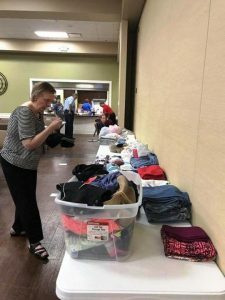 But they’re open now, supplying food, clothing, and shelter to those in need. This is the America I recognize. We pull together, lift each other up, help those who need help. It’s how I was raised, and I’m so glad to see that it is apparently also the way a lot of other Texans were raised. Let me wrap this up with a “not so” Random Pic of the Week. I don’t know who took this one, but it’s been running around the interwebs for the last day or so. It’s a powerful image, and doesn’t really need any comment so I’ll just leave it right here for you. Stay dry everyone. Stay safe. I’ll talk to you next time.